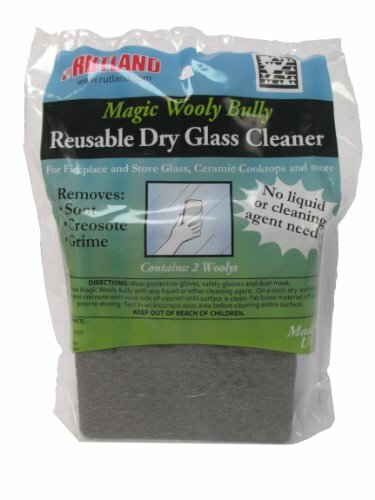 Rutland Magic Wooly Bully Reusable Glass Cleaner by Rutland Products at Sacred Hearths LA. MPN: 88. Hurry! Limited time offer. Offer valid only while supplies last. The Wooly Bully is a reusable, dry glass cleaner that removes soot, creosote and grime from fireplace and stove glass, ceramic cooktops and more. The Wooly Bully is a reusable, dry glass cleaner that removes soot, creosote and grime from fireplace and stove glass, ceramic cooktops and more. Because of it's unique design no liquid or cleaning agent is needed to dispense of the grime and build up on your glass surfaces. Package contains two Wooly's. If you have any questions about this product by Rutland Products, contact us by completing and submitting the form below. If you are looking for a specif part number, please include it with your message.